Looking for a better product and a better business deal? Submarina® – Voted best sub in San Diego fifteen years in a row! What is it about Submarina that the locals in San Diego know that you don't? 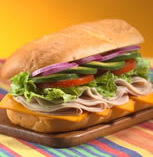 Submarina meats, cheeses and condiments are of premium quality and selection. We'll show you the difference and you will never look at a sub sandwich the same way, again. Since our national roll-out in November 2006, we have commitments for over 1,000 units. Now is the time to select the best available location in your marketplace. Expert team specializing in site selection, lease negotiation, design, permitting and construction. Our team has helped build hundreds of franchise concepts and they'll get you built and open too! Come visit us in beautiful San Diego – Meet our staff, visit our stores, taste our products, talk to our owners, review our financial records and then you will understand why we believe this is a great deal for the first time business owner or the seasoned business professional looking for plenty of room to grow and prosper.